Bear was found in Clearfield county hopping along a dirt road in the middle of the woods a few miles away from houses and electric poles. Stephen saw him and got out of his truck to take a closer look. The rabbit hopped away and Stephen got back in the truck and started to drive off. When he looked in the rear view mirror he noticed the rabbit following him again down the dirt road. He slowed down and the next thing he knew the rabbit was beside him. Stephen drove really slow and the rabbit followed him for a quarter mile. Stephen finally got out and picked the rabbit up and put him in the truck. He was obviously a domestic rabbit. We named him Bear because he was found on Bear Run Road. Bear would most likely not have survived much longer in the woods. Stephen fed him cheerios until he was able to get some rabbit feed the next day. Bear did not poop for a couple days, showing he was not eating well in the wild. 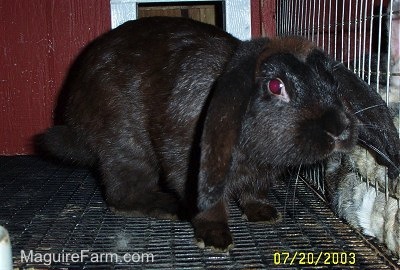 The lucky bunny now lives with us in his double wide rabbit hutch. Stella was given because her former owners were moving and could not bring her with them. Stella came with her teddy bear and blankie.